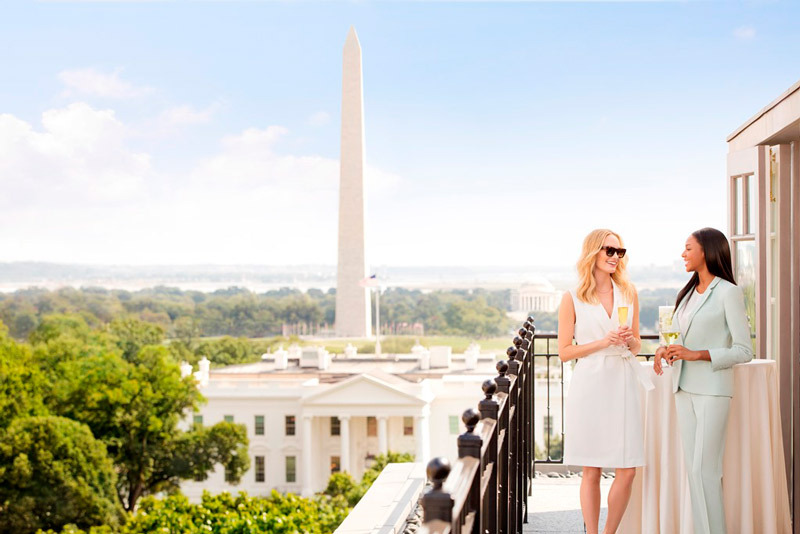 Check out these unique outdoor event spaces with unparalleled views of the nation’s capital for your next meeting. 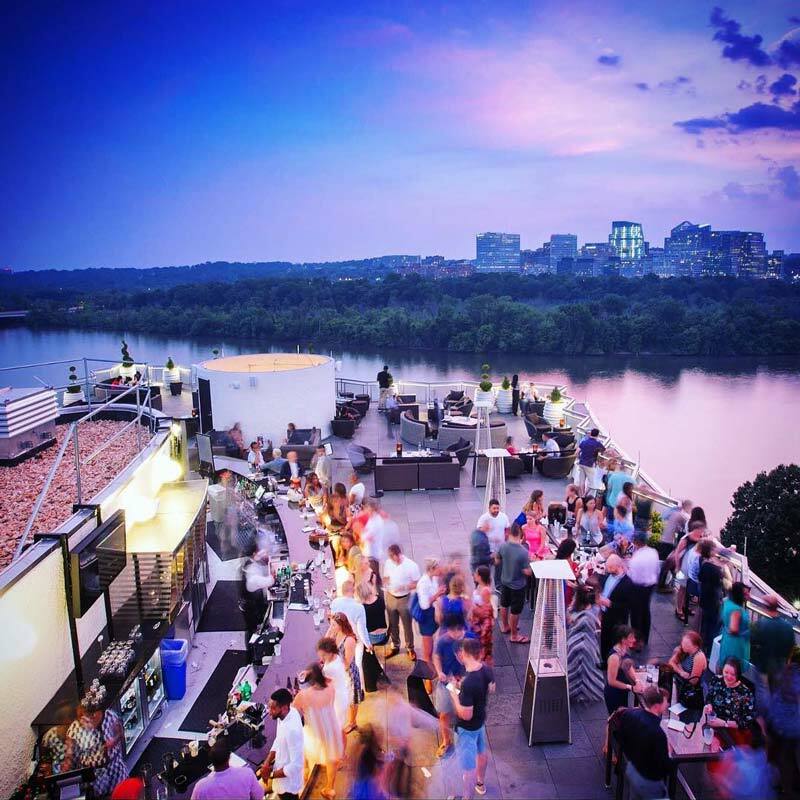 Rooftop and outdoor venues boast breathtaking views overlooking the top of the Washington Monument, the Capitol Building and DC’s scenic pathways and waterfronts. 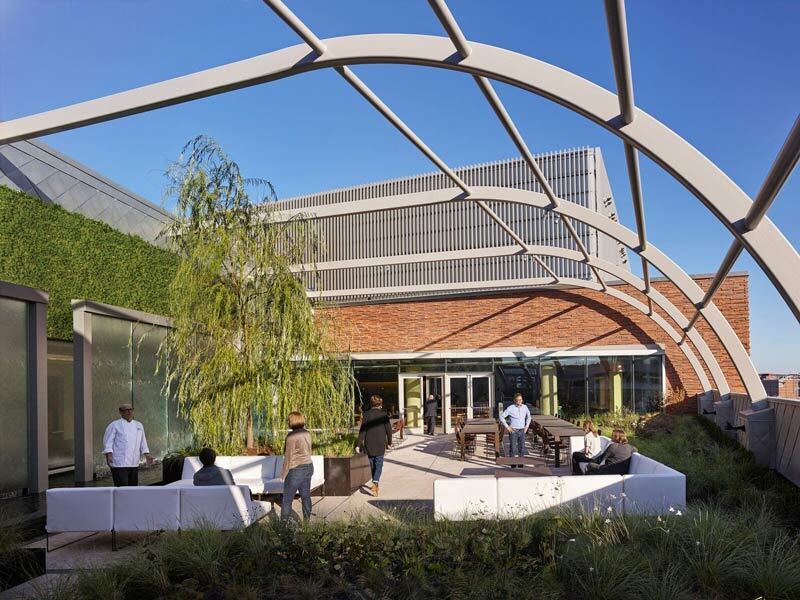 Find the perfect location to suit your outdoor meeting with these picks. The newly renovated International Spy Museum in L’Enfant Plaza, which will be complete in early 2019, brings more than double the original exhibit space and many new areas to host events. The spacious rooftop terrace boasts phenomenal views of the city and has a capacity for 350 guests for a reception. The Top of the Gate rooftop at The Watergate Hotel boasts a 360-degree view of the Key Bridge, Potomac River, Washington Monument and the Kennedy Center, making for an unforgettable experience. The lounge can host private events for groups as small as a 20-person meeting or as large as a 300-person soirée. The highly anticipated hotel, set to open in winter 2019 in CityCenterDC, will feature a rooftop bar with substantial event space and gorgeous city and Capitol views. At Kimpton Mason & Rook Hotel, rooftop opportunities elevate meeting and event experiences. The rooftop can easily accommodate 100 guests, while also offering seating and setups in theater or ceremony style for 40 guests comfortably. The Biblical Gardens at the Museum of the Bible are a unique open-air space for afterhours events. The rooftop venue is a beautiful setting for a reception or dinner in the spring, summer or fall with flowers and greenery chosen based on references in the Bible. The space also features the Tree of Life in the center of the garden. 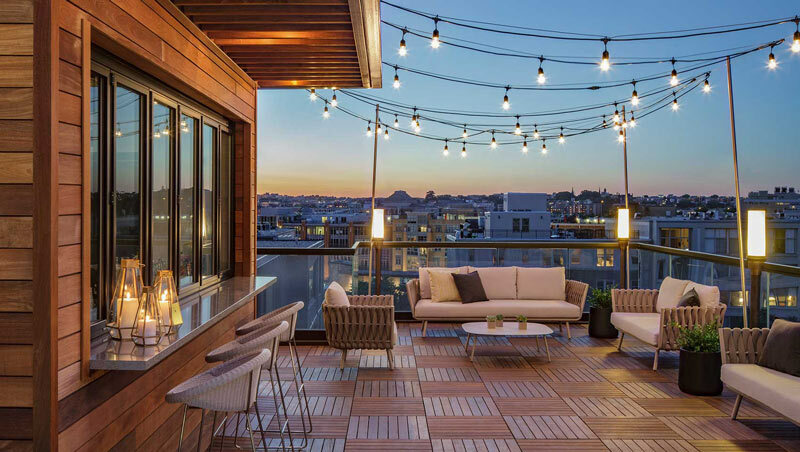 Bringing additional style to Adams Morgan, The LINE DC lets you take in the city on its Vela Rooftop Terrace with a panoramic view of the Capitol and the Washington Monument. Open year-round, the beautifully landscaped 5,590 sq. foot space has the capacity for 220 people and can be easily customized. The Top of The Hay at The Hay-Adams is the perfect spot for your meeting, wedding or reception. Located on the ninth floor, the outdoor balcony features French doors and panoramic views across the city. The space can be divided and combined into various sizes suitable for 10 to 340 guests. The 9th Floor Rotunda and Terrace is one of the most versatile spaces at this classic steakhouse on Capitol Hill. With beautiful views of the Capitol building and both indoor and outdoor space, it’s the perfect venue for receptions, sit-downs and business meetings alike. The area can accommodate 150 guests for an indoor reception, 250 guests for an indoor/outdoor reception and up to 100 guests for a seated dinner at round tables. The tented, climate-controlled Grand Rooftop Terrace also provides a breathtaking view of the city. Rosewood’s Rooftop Bar & Lounge boasts gorgeous panoramic views of the city and a refined menu of craft cocktails and light bites. With several distinct seating areas, including intimate alcoves, bistro-style dining tables and the unobstructed sundeck, the rooftop can accommodate up to 100 guests. Both the Center Field Plaza and Delta Terrace are two great spots to host outdoor meetings at Nationals Park. Center Field Plaza is a large and flexible meeting area. The nearby high-definition LED video board outside is a great way to display your company logo and accommodates between 840 – 1,700 guests. The Delta Sky360 Club features a stage and a podium, both perfect for an outdoor meeting or presentation. 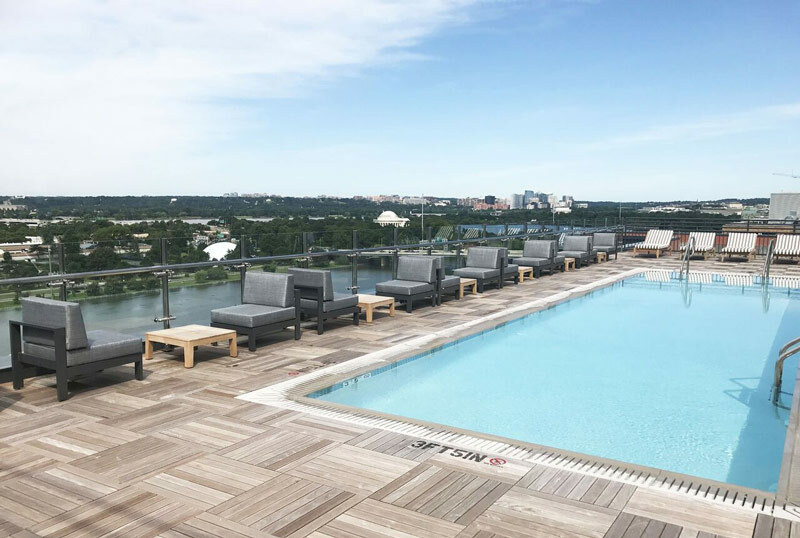 The rooftop pool and lounge at InterContinental Washington DC – The Wharf lends itself to stunning views of the Potomac River and entertaining views of the Southwest Waterfront. The rooftop is available for private events with the capacity for 60 guests seated and 100 standing for a private event. 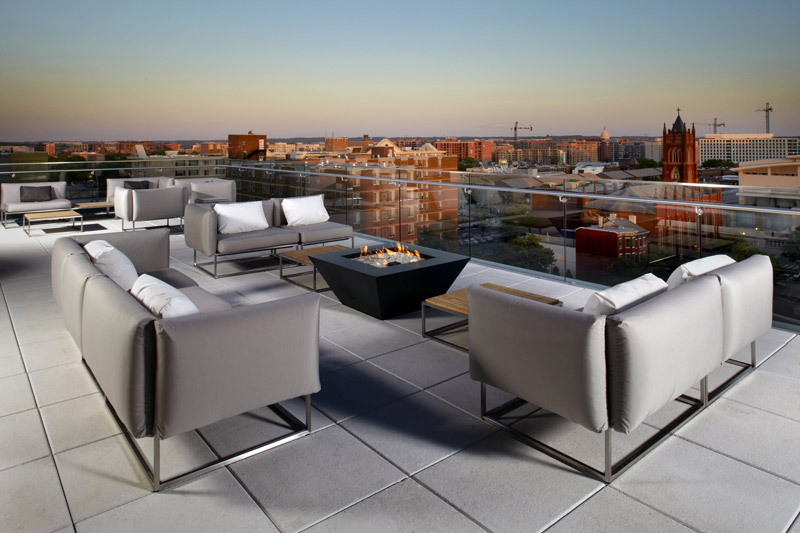 Located near the Walter E. Washington Convention Center, Capital One Arena and many other attractions, Cambria Suites Washington, DC boasts a rooftop and penthouse outdoor patio with a fire pit. The patio has a seating capacity for 120 guests. 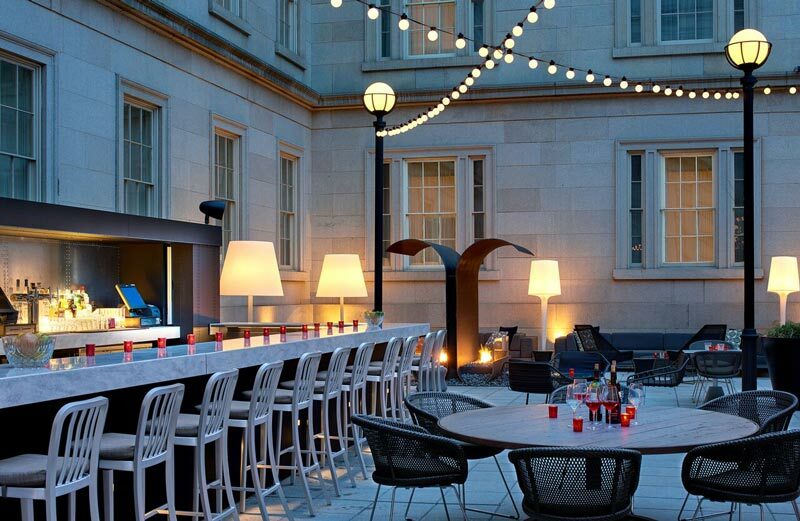 Especially during the summer, the courtyard at Dirty Habit inside the Kimpton Hotel Monaco is hopping with business professionals for happy hour. The space brings a warm vibe with bistro string lights, firepits, sofa lounges and a full-service bar. It can be divided into multiple sections and provides various options for groups from 10 to 500 people. The completely renovated, eco-friendly Civil-War era building has a landscaped garden, perfect for hosting weddings and events of any size. 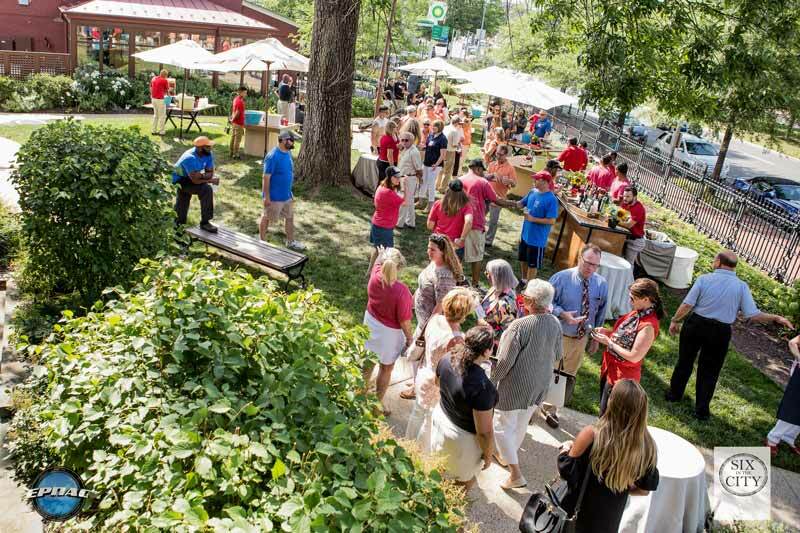 Located one block from the Eastern Market Metro station, the venue accommodates 400 guests standing and 220 seated. 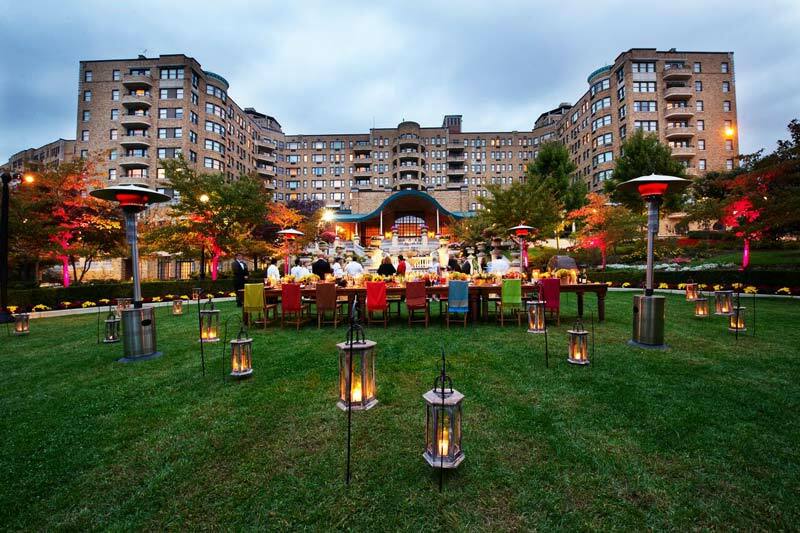 Situated on 11 lush acres that overlook Rock Creek Park, the Omni Shoreham Hotel frequently hosts different types of outdoor functions including dinners, cocktail hours and meeting breaks in its two spacious outdoor terraces. Active travelers can take advantage of the hotel’s proximity to Rock Creek Park’s biking/running routes and workout stations. 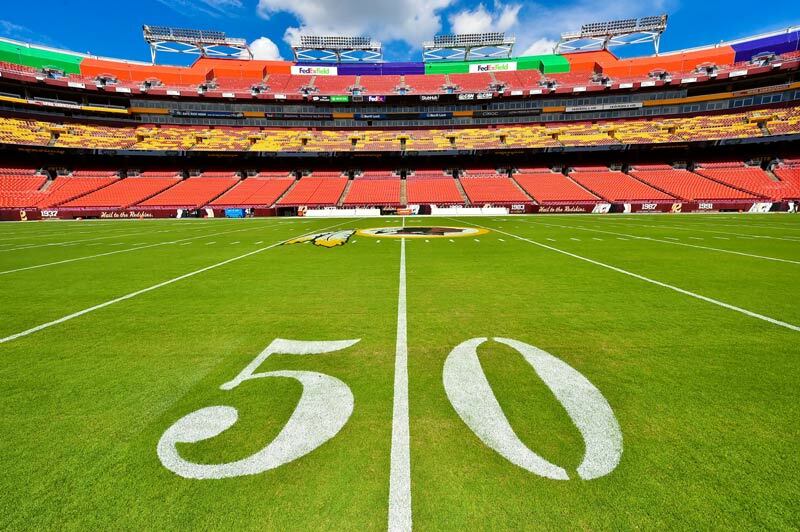 The Bermuda grass playing field of the Washington Redskins provides an awesome outdoor experience for your event whether it be a corporate luncheon or awards ceremony.